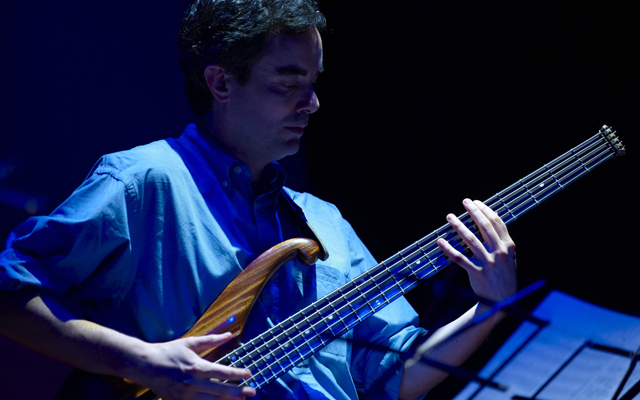 Fernando Huergo has made a glittering career in his role as electric bassist fronting various ensembles and performing on a slew of recordings. A virtuoso electric bassist who is perceptively influenced by Jaco Pastorius, Huergo has nevertheless developed his own voice and vocabulary that, like Pastorius, employs fleet single notes blended in with stylish harmonics. 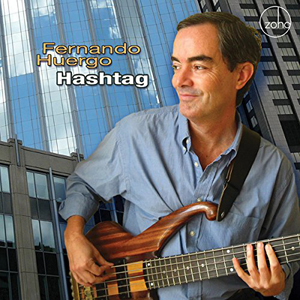 Many bassists of this generation do likewise but few of them have the musical intellect of Fernando Huergo. His choice of notes is inspired and he refuses to be constrained by what is safe to play behind melodies. Moreover his harmonics are used sparingly, and always come with the element of surprise, clean articulation and flashes of fiery virtuosity. Add to all of this is the not-so-incidental fact that Fernando Huergo was born in Córdoba, just outside Buenos Aires, where the folkloric – chacarera dance – is king. Huergo spent his early years soaking in the complex compound metre of 6/8 and 3/4 of a dance (and music) that served as the rural counterpoint to the urban, cosmopolitan imagery of the tango. This particular rhythm is elementally Argentinean – as local to that country’s folkloric tradition as the tango. It is also one that has made its graceful way into Huergo’s music allowing him inform even standards with its dramatic inflections. You hear this often and to great effect on Hashtag, Huergo’s 2016 recording released on the Zoho Music imprint. The name may seem to ride the crest of a trending subject but more than anything else, Huergo seems to be saying that it’s time to sit up and take notice. As part of the ‘sit-up-and-take-notice’ Huergo has assembled a find group of musicians rather cleverly putting tenor saxophonist Rick Dimuzio in the same coral as his flutist Yulia Musayelyan. Here is a partnership where the music of Argentina meets that of the US. The cultural collision creates a perfect storm with Huergo riding in its powerful eye. Moreover the group also includes the brilliant young pianist and keyboard specialist, Leo Genovese, another Argentinean who is blazing his own unique and very visible trail across the musical stratosphere. Genovese is elegant, lyrical and masterful. His solo on Thelonious Monk’s ‘Evidence’ is brilliant and fiery. It is the most unexpected solo break that fuses the early choruses of the piece and melding its (chacarera) introduction with a Huergo-like Latin-Jazz hybrid through the rest of the piece. In a cleverly designed programme – for one can only call it that – Argentinean rhythms dance and sing their way through ‘Evidence’, Mongo Santamaria’s ‘Afro Blue’, Wayne Shorter’s ‘Infant Eyes’ and Duke Ellington’s ‘U.M.M.G.’ None of this is a coincidence, but rather a clear path to appreciating two things: the elasticity of Jazz and Huergo’s mastery of the ‘cultural collision. But that’s not all. The rest of the repertoire is all Huergo’s. The bassist is not only a prolific composer, but also one who mixes persuasive grace and originality. This is a quality to be admired in Fernando Huergo and adds extraordinary credence to his virtuoso playing of the electric bass. Track List: Hashtag; Trunca; Cerca; Evidence; Troesma; Falling; Infant Eyes; Weather; Afternoon at the Gallery; Afro Blue; Astor; U.M.M.G. Personnel: Yulia Musayelyan: flute; Rick Dimuzio: tenor saxophone; Fernando Huergo: electric bass; Leo Genovese: piano, Fender Rhodes, electric piano; Franco Pinna: drums.